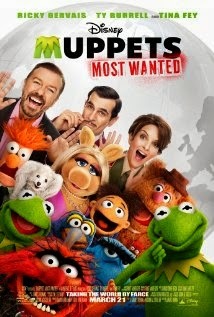 Muppets Most Wanted (2014), PG, 112 minutes - Jim Henson's Muppets are timeless. Especially for anyone close to my age. That being said, some Muppets movies are better than others. Muppets Most Wanted is the eighth big screen adventure for everyone's favorite set of puppets, and while it may not be quite on par with 2011's The Muppets (which successfully re-introduced the franchise to theaters and a whole new generation of fans), it is definitely superior to 1999's Muppets from Space (which effectively put an end to the film franchise for twelve years). Muppets Most Wanted picks up immediately after 2011's The Muppets. Immediately, as in as soon as the final musical number ends. The Muppets have successfully kept their theater open and are approached by Dominic Badguy (Ricky Gervais) about his becoming their manager and taking them on a world tour. Kermit is a little leery, not just because of Dominic's last name (he tells them it is pronounced Badgie), but also thinking that they shouldn't get ahead of themselves. But Badguy promises The Muppets the world and they outvote Kermit. What they don't realize is that Badguy really is a bad guy, is in cahoots with 'the world's most dangerous frog' Constantine (wouldn't you know it, he's a virtual dead ringer for Kermit), and the world tour is a cover for a series of heists. Budguy and Constantine frame Kermit, leading to his arrest and incarceration in a Russian Gulag. This is a Muppets movie after all, so not only does this sound ridiculous, but it's entertaining and you know it turns out well. Ty Burrell (Jean Pierre Napoleon) and Tina Fey (Nadya) are the two other primary human roles in the film as a French Inspector and Gulag overseer respectively. And as always, there are a slew of other cameos in varying roles: Tony Bennet, Hugh Bonneville, Jemaine Clement, Sean Combs, Rob Corddry, Mackenzie Crook, Céline Dion, Lady Gaga, Zach Galifianakis, Josh Groban, Salma Hayek, Tom Hiddleston, Toby Jones, Frank Langella, Ray Liotta, James McAvoy, Chloë Grace Moretz, Usher Raymond, Saiorse Ronan, Danny Trejo, Stanley Tucci, and Christoph Waltz. We also see the return of Walter, the newest Muppet who was introduced in the 2011 film. As Muppets films go, Muppets Most Wanted falls in the middle of the bunch but is well worth a look if you enjoy the characters (and honestly who doesn't? ), or if you've got any little ones. It may be a sequel to the last film, but it stands on its own well. You won't be completely lost if you haven't seen The Muppets (you just may find yourself asking where the heck Walter came from). - The very beginning of the film seemed just a bit awkward to me. It made sense in the timeline of the story, but I felt it was awkward because there were obvious stand ins for Jason Segel's and Amy Adams' characters (albeit only for a few seconds and only from behind). Unfortunately, neither of them were involved in this sequel. - It was good to see Walter carry over to this film as one of the crew considering he was so integral to the last one. - My personal favorite cameos where those by Tom Hiddleston, Josh Groban, and Usher.